For lively straight hair that moves with you! You think straight is boring? Think again! An exclusive formula bringing life to straight hair. With Silk Proteins, gently lock in the alignment of each strand without sealing them together. Hair so vibrant, silky, full of movement*, so you have your hair always on your side! Its exclusive formula gently locks in the alignment of each strand without sealing them together. Ready? Pour into your hand, apply evenly over your hair especially on ends, and then rinse thoroughly. 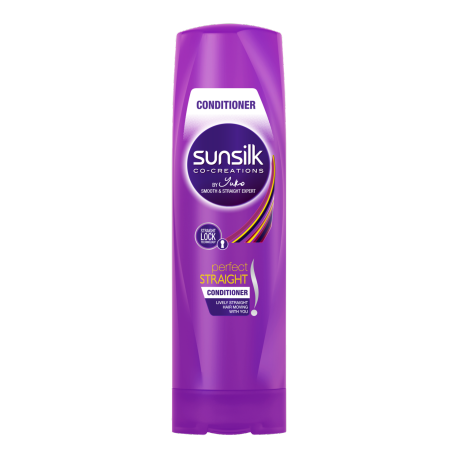 For even more incredible hair, why not combine it with the whole Sunsilk line? Who said straight hair has to sit still? We want ours full of life. Do not know how to deal with damaged hair? We have the best tips for trying to get it back. Check it! Stop dandruff and get a perfectly healthy head. Valuable tips: Save on the products and be gentle with your hair.